Installing a T-Armond neck pickup upside down, you do that? I put T-armonds in my m77 with the bridge one flipped, now wondering if I should flip the neck too if only to make the middle position better due to what TV said. I already love the neck tone as is although it could be a little less boomy but I really mostly play this guitar quietly at home. Did you read my posts starting 1- 54 heffe? I read the entire Post, which I will say was very interesting. Theres a lot of debate and views in regards to pickup sound and its position on the guitar. Very informative,, good to see TV chime in and straighten things out. But my brain started wondering about pickup relation in regards to Lefty's and then I got all "turned around" myself.Either way great Thread. Whoa. 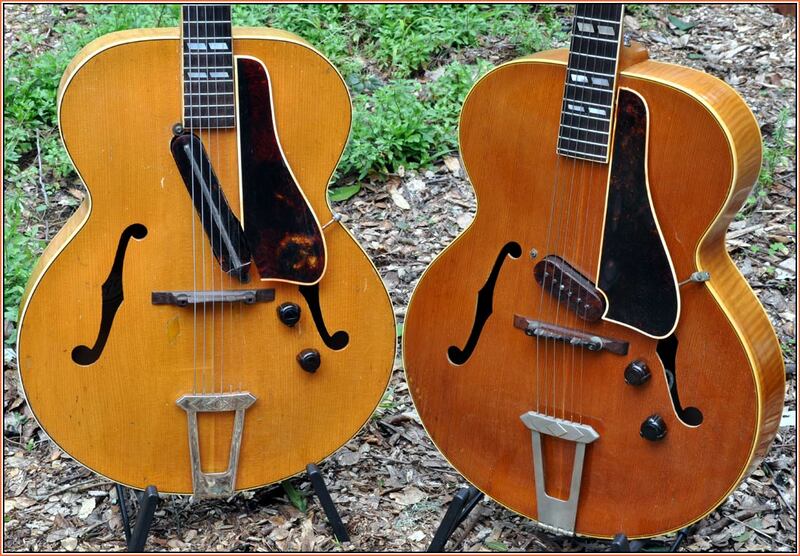 I can't imagine the one on the left sounding very good. I never tried flipping around the neck pickup (I like the sound, so why bother? ), but getting the polepieces farther from the bridge does help, in my opinion. Those pickups can be harsh if you're not careful. There's a guy around the Philly area who I think is pretty well known who has a Tele with the bridge pickup slanted the opposite way so the bass strings are picked up closet to the bridge and the treble strings closer to the middle. I would think that would yield good results. This is probably my favorite post on TGP--After I got the neck re set on my beloved 1955 Corvette, it played like a dream, but there was just something missing, every time I took it to practice despite the gorgeous Neck Dynasonic, I just couldn't get the sound I was hoping for--Then I found this post I flipped the pickup and immediately I heard "that" sound.....Say what you like People---Flipping that pickup Sure worked for me ! I wouldn't turn them around. It limits the tonal range. I think Tom recommends that because he put the cable on the wrong side. Correct me if I'm wrong but this whole reversing neck pickup started with the Peter Green's Les Paul. Players started reversing their pickups thinking that it was the reason Green's guitar sounded so good. It had nothing to do with his pickup positioning but rather due to the way the pickup was wired. And his magic touch of course. I dont know who Peter Green is, I will google him but these pickups arent Gibson pickups in any regards unless we are talking about staple single coils. flipping the pickup the massive output on the low wound strings, was attenuated for a more balanced sound across the strings and relational output to the bridge pickups Low E and A strings. Pole to pole aperture is changed too. I don't know who Peter Green is either. In my instance I was flipping the humbuckers on the Yamaha(now tapped to be single coils) intentionally to limit the neck pickups frequency response to get the sort of sound I'd grown use to. I had been playing the same pair of 1960s gretschs with Hilotrons through the same rig for years and didn't want to adjust my amps EQ when I switched guitars. I like the guitars all to be in the same ballpark, and my super reverb has plenty of bottom. They're still unique unto themselves but the sound is balanced to my setup. If you guys really don't know who Peter Green is, you're in for a very pleasant surprise. Surprised no ones added that this yet. Hairy fellahs gettin mean! I flipped the bridge and neck Gretsch Dynasonics in my Duo Jet and it works great for me. Dynasonics are extremely sensitive pickups. Flipping them made an even bigger difference than I thought it would. I was ready to TV Jones my Duo Jet but, ironically, TV Jones and Tavo saved me money. I really like the inherent tone of the Gretsch Dynasonics so I'm happy I could get them balanced. Thanks! He had the magnets out and mixed them up, IIRC. I switched both Dynas round on my Sparkle Jet. I was nicely surprised; the bridge seems better balanced now, and the neck a bit less woofly. I'm still thinking about a set of TAs at some point, just to make things a bit quieter, but there'e no hurry. I love this guitar! I kept my pickups the same way but turned the guitar around. I like some of that peter green playing on the videos above as he sounds a bit mean n moody. Green Manalishi is cool too. If you think your Dynas are too boomy, flip them over. a new life awaits! maybe not but you wont have to turn the bass off on your amp anymore. It does make me wonder if all this trouble with a neck Dearmond may have been the reason Eddie C ended up with a P90 there. I'd love a P90 in a T-Armond shell on my Jet, but I recently emailed TVJones to be told it can't happen.